(Release Date: February 18, 2014)  In the middle of production during the theatrical release of Tim Burton's revivalist "Batman," Sam Raimi's "Darkman" joined that 1989 smash box-office hit a year later as one of the first in a pulpy cinematic renaissance of superhero stories. This one, however, was not adapted from a comic book, but born from the imagination of writer-director Raimi himself as an ode to Universal's 1930s horror pictures. That inspiration drips from every conceivable tilted angle and neo-noir flourish as the filmmaker weaves a sordid tale of scientific discovery, doomed romance and vigilantism. Liam Neeson brings a heavy sense of loss and pathos to Peyton Westlake, a scientist on the verge of a synthetic cell breakthrough that will be able to replace damaged skin. When sociopathic mobster Robert Durant (Larry Drake) comes calling at his lab, in search of a confidential memorandum revealing powerful land developer Louis Strack Jr.'s (Colin Friels) bribery tactics, Peyton is horribly burned in sulfuric acid and presumed dead in an explosion. Peyton's attorney girlfriend, Julie Hastings (Frances McDormand), is devastated by the loss and attempts to move on as Strack sweeps in to comfort her. What she does not know is that Peyton is not deceased after all. Using a series of facial disguises, each one disintegrating after 99 minutes when exposed to light, Peyton sets out to make Durant and his henchmen pay while exposing Strack's dirty dealings. For a movie entitled "Darkman," it is odd that Peyton never takes advantage of his early finding that synthetic skin cells endure only when in darkness. Until the dizzying climax taking place on the steel beams of a construction site 650 feet in the air, Sam Raimi sets the majority of his scenes in the daytime. Backed by Danny Elfman's superlative music score, Bill Pope's enlivened cinematography, and outstanding make-up work transforming Neeson into a deformed, "Phantom of the Opera"-esque pariah, the film heaps on the style while never losing sight of its sympathetic protagonists (Peyton and Julie) and the bevy of intentionally over-the-top villains they must face. The pleasingly cohesive action sequences are stunning when one takes into account the intricacy of their optical effects and stunt work (CGI was still in its infancy at the time of filming) and the tension Raimi manages to rustle up. "Darkman" was followed by two direct-to-video sequels, but it could haveand probably should haveremained a standalone one-off of savvily made energy and inspiration. 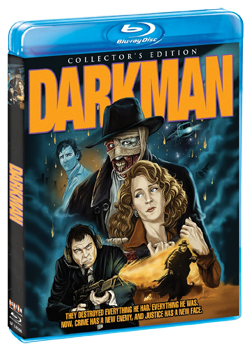 The 96-minute "Darkman" was previously released on Blu-ray by Universal Pictures in 2011, and this Scream Factory Collector's Edition appears to recycle that disc's 1080p master. Some shots are softer than others and colors range from bold to ever so slightly faded, but overall this is a mighty pleasing transfer with an undoubtedly noticeable uptick in quality from the dusty days of standard-definition DVD. The opening credits are littered with specks of dirt, only for the image to clear up nicely thereafter. Beyond these small observations, the film looks splendid, intermittently appearing to be either a new movie or a catalogue title that, short of an expensive remastering, is in impeccable shape. For a DTS-HD 5.1 Master Audio track that decidedly favors the front channels, the aural presentation is robust and full. Could it be a little more dynamic in its surround capabilities? Sure, but in doing so a certain amount of artificial tweaking would have been required. Taking into account that this is a nearly quarter-century-old feature, it sounds more truthful and natural to its source as is. A DTS-HD 2.0 Master Audio track is also graciously included. Scream Factory's jam-packed Collector's Edition Blu-ray of "Darkman" renders all previous versions of the film put out on VHS, Laserdisc, DVD and even Blu-ray obsolete. It is an overwhelming package, looking and sounding as goodif not betterthan it ever has, and further outdoing itself with over three and a half hours of bonus content. Particularly major gets are brand-new interviews with Liam Neeson and Frances McDormand, who are honest and enthusiastic about their work here and discuss their experiences making the picture. Indeed, anything a person could possibly want to know about "Darkman" will likely be found within Scream Factory's exhaustive release. Highly recommended.